SABRETOOTH DEATH HUNT 1 2 3 4 MARVEL 1993 + SABRETOOTH IN THE RED ZONE 1! Sabretooth #1 (Aug 1993, Marvel) Great cover , 9.2+ condition. 1 product rating - Sabretooth #1 (Aug 1993, Marvel) Great cover , 9.2+ condition. SABRETOOTH #1 Aug 1993 HIGH GRADE KEY BOOK! SUPER SALE! CHEAP! COMBINED SHIP!! 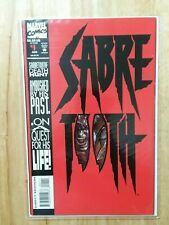 Sabretooth #1,2 lot! 1993 Marvel. Mark Texeira artwork! Great series! SABRETOOTH 1-4 COMPLETE LOT 1993 NM 9.6!!! Sabretooth #1-4! Complete limited series (1993)! Marvel! X-Men!